The importance of motivation is obvious. We need motivation in order to reach our goals. In fact it is one of the most important and driving factor for us reaching our goals. So when that being said it is not hard to imaging how things would be if there was no such thing as motivation. Motivation does not have to be positive emotions. Fear can be a very effective motivating factor. Stress is an example of negative motivating ineffective feelings. Most people have a tendency to become narrow sighted when they are stressed, some even get paralysed or apathy. Is motivation important in the workplace? You bet! Why? First, you spend more time at work than you do awake at home. And typically, work environments are very goal oriented. Some people argue that getting goals motivates people. This is of course not true. It is the rewards for reaching the goals that motivates or the feeling of fulfilment when they reach their goals or the satisfaction of being important etc. This is why many companies and organisations are very strong on bonuses and appraisals. Motivators are people that are good at motivating others, they are often perceived as exciting, fast, outspoken, engaging, enthusiastic, creating and fun. “There is always something new going on”. They are often very good at getting others to want to take on new challenges. Their need is to be unique and that is driving their motivation. Needles to say the importance of motivation is high. 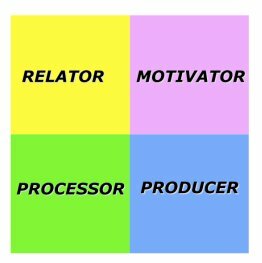 Producers are people that often are perceived as goal oriented, strong, self confident, practically, down to earth and determent. “They go straight for the problem”. Producers are good at driving towards goals. Their need is to be in control and that is driving their motivation. Processors are often perceived as well thought through, objective, consistent, serious and logical. “Nothing gets lost”. They are good at structuring and analysing. Their need is to understand and that is driving their motivation. Relators are often perceived as supporting, loyal, trustworthy, considerate, calm, friendly and caring. “Always at hand when needed”. Relators are good at creating and maintaining good relations with other. Their need is to be liked and that is driving their motivation. So, you see, a well thought through bonus and appraisal system also needs to take these different aspects into considerations. Everybody wants more money, sure. But it’s the how that differs. My advice for companies would be to put much more energy into supporting managers in how to handle different behaviour styles. But then, I’m a Relator of course.